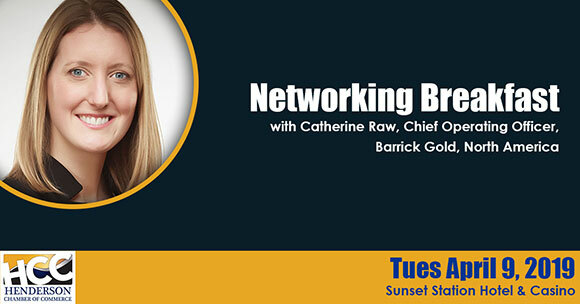 HENDERSON, Nev. – The Henderson Chamber of Commerce will host its monthly networking breakfast with guest speaker Catherine Raw, chief operating officer of Barrick Gold of North America, from 7 to 9 a.m. Tuesday, April 9, at Sunset Station, 1301 W. Sunset Road in Henderson. During the breakfast, Raw is set to discuss Barrick Gold’s merger with Randgold Resources and their upcoming joint venture with Newmont in Nevada. Raw will oversee the joint venture between Barrick and Newmont. She holds the chartered financial analyst designation, a master’s degree in natural sciences from the University of Cambridge’s Downing College and a master’s of science in mineral project appraisal from the Imperial College London. The event is sponsored by Las Vegas Lights Football Club. Cost for the breakfast is $35 for members and $55 for non-members. There will be an additional $10 charge for walk-ins. RSVP online at www.hendersonchamber.com by Friday, April 5.